A battle is underway between Japanese Prime Minister Shinzo Abe and South Korean President Moon Jae-in over their differing approaches to North Korea. They are competing to shape the attitudes of US President Donald Trump, and this contest has been a compelling sideshow at the PyeongChang Winter Olympics. 2017 was Abe’s year. Mainichi Shimbun, Japan’s most influential centrist newspaper, recently editorialised that “Abe is without doubt President Trump’s most trusted foreign leader”. This is often noted in Japan and, with some pride, that many world leaders consult Abe on how best to deal with Trump. Abe used his influence to nudge Trump towards Japan’s desired policy on North Korea: maximum pressure until Pyongyang announces denuclearisation, followed by multilateral talks. But the Japanese Prime Minster’s influence on North Korea policy is threatened by Moon’s push for Seoul–Pyongyang and Washington–Pyongyang bilateral talks. Since the start of 2018 and the Olympic détente with the North, events have put Moon at the centre of North Korea policy, causing great unease in Japan. Moon is frequently described in the Japanese press as hannichi (anti-Japan) and shinboku (pro–North Korea). Last week on Prime News, one of Japan’s premium political news shows, Moon was described as North Korea’s kogai (child or disciple). 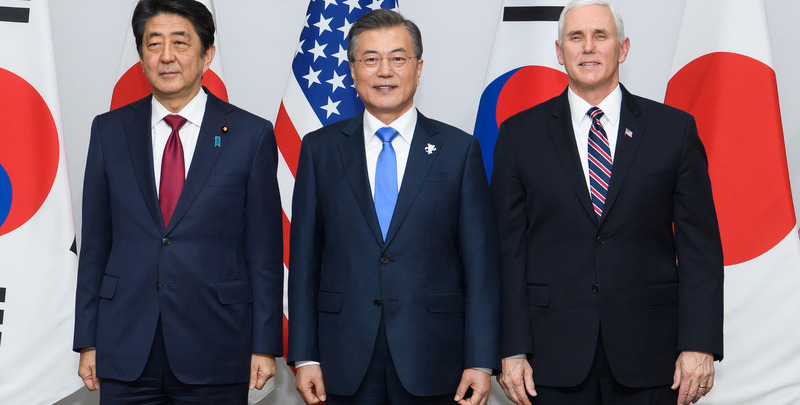 According to Japanese media reports, one reason that Abe attended the PyeongChang opening ceremony, despite opposition from most members of his LDP party, was to urge Moon to hold the current policy line. Abe wants to see a resumption of the planned US–Korea military exercises that were suspended for the Olympics. However, in PyeongChang, Kim Jong-un’s sister and special envoy, Kim Yo-jong, invited Moon to Pyongyang to become the first foreign leader to meet the North Korean leader. Moon has more sway than Abe with Trump on when and in what form the US–Korea military exercises are renewed. It is reported that US Vice President Mike Pence, with Trump’s blessing, and Moon agreed on terms to further engage North Korea, in a move towards Moon’s strategy of “maximum pressure and engagement at the same time”. In response, Abe and Trump held phone call for more than an hour, after which Abe walked out to the press scrum at the Prime Minister’s office to report, “dialogue for the sake of dialogue would be meaningless”. Later, the Japanese Ministry of Foreign Affairs revealed that during the call it was agreed there would be “no meaningful dialogue” unless North Korea agreed on “complete, verifiable and irreversible denuclearisation” – a push back in Abe’s direction. Shigeharu Aoyama, a regular media guest and powerful politician in Abe’s ruling party, outlined Japan’s fears that under Moon’s approach, the US and South Korea could conceivably cut a deal that leaves North Korean missiles still able to strike all of Japan; leaving the rachi mondai (the longstanding issue about Japanese citizens abducted by North Korean agents), a potent domestic matter, off the agenda. One of Japan’s top public intellectuals on North Korea, Sotesu Ri, called for Abe to use his leadership to stop, particularly Trump, “wavering” from the current policy. As the Winter Olympics torch is about to be extinguished, it seems that Moon may challenge Abe as the foreign leader with the most influence on Trump’s North Korea policy. Abe is not going to let it go without a fight. The Chinese delivered a masterful display of pure spectacle, ego flattery, and diplomatic theatre.